(Spain and Portugal, The Iberian Peninsula, or.) NE-sheet. With threefold miles indicator and list of coventional signs. Map by Friedrich Wilhelm Streit (Ronneburg, Thuringia, 1772 – Berlin 1839) colored in outline. Steel engraving. Berlin, Natorff & Co., (1837). 9 × 11⅜ in (23 × 28.9 cm). 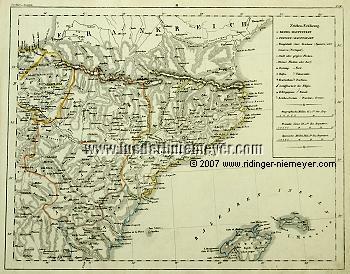 The Basque coast from Dega to Bayonne , the coast of the Mediterranian from Murviedro to Montpellier . With Minorca and the greater part of Majorca . – With road net, canals + harbour places .